I hope you're having a good day (Good day for a fish or for a good nap, I'd say!) and enjoyed the lovely Florida sunshine while we had it. Yesterday was so pretty, even though it was hair and nails day and I didn't get to enjoy it too awfully much!!! I gave the doggies a bath at 10 am when it was warm and they survived even though they HATE a bath. They do like the brushing part though!! On to stamping. Just one class this week! We made 2 (I think) really great cards. I've been trying to do a few more masculine cards lately and since we have wonderful tools to make those cards, let's go for it! Our first card used the beautiful 6x6 papers from the 2019 Occasions Catalog. 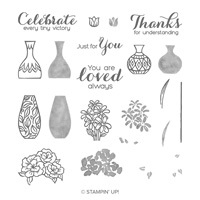 The vases punch is from the Annual Catalog but there is a beautiful stamp set that coordinates, "Vibrant Vases". I chose Balmy Blue for this week's card but if we use this card in the coming weeks with other classes, I'm going for the Daffodil Delight and the Highland Heather! 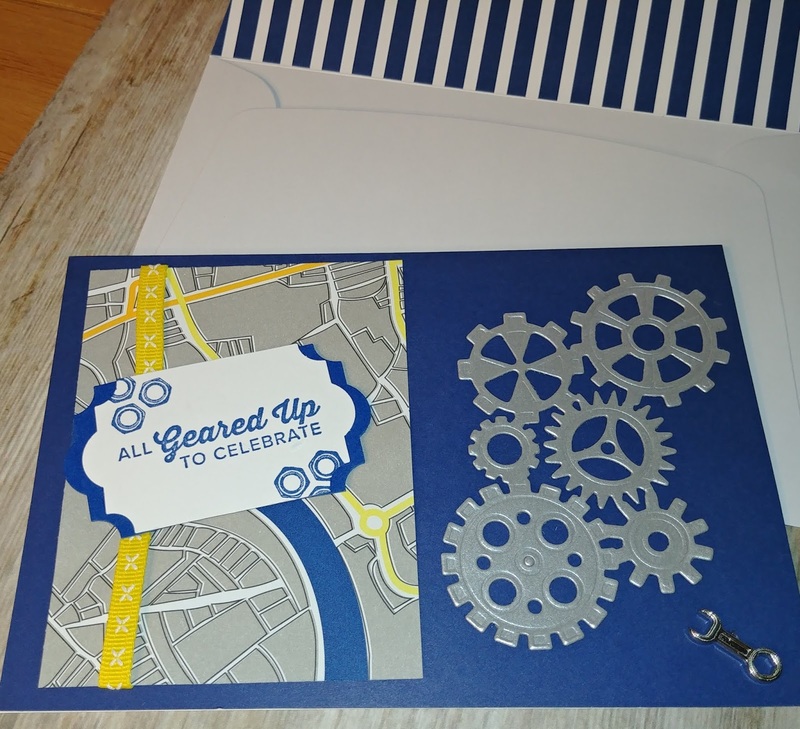 Hooray for Garage Gears! Don't you just love the stamps, the framelits and the DSP choices that complement them perfectly!! 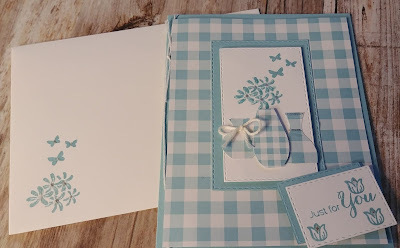 I also took advantage of the Happiness Blooms cards and envelopes. They are Night of Navy with a jaunty striping on the inside of the envelope. 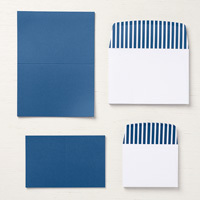 The kit comes with 10 large and 10 smaller notecards and envelopes for just $8.50. What a timesaver! 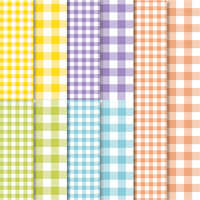 Oh the fun.......Click Here to see all that is new in the world of Sale-a-Bration! Classic Cars and Beautiful Tea Pots!